I’m slow (for now), go around! Part three of the my first trackday saga or the part where I actually drive a car. Be forewarned while this is ostensibly the interesting part of my story it’s also the longest and to further exacerbate that I’m also running out of new pictures. Hopefully it’s still interesting enough that a few of you are able to slog all the way through! After getting the signal to go I gave the car a gentle launch so as to not humiliate myself by stalling it again and rolled into the gas. I grabbed second as I left pit lane and paid special attention to stay to the left of the blend line before entering the first turn. I’ll spare the gory details, but suffice it to say my first couple laps were quite slow giving me ample time to practice the point-bys that I’d heard so much about in the drivers meeting earlier. After two or three laps I started to get a basic feel for what speed I could enter corners and what gear that meant. At that point I became less of a rolling chicane and started trying to find speed. Somewhere around this time I had a C7 come up behind me to pass and of course I let them by as soon as possible, but this time I made an effort to keep up with them and follow their line. I found that shockingly I was able to keep up with them. Having someone to pace myself with made this middle part of this first session a lot easier. 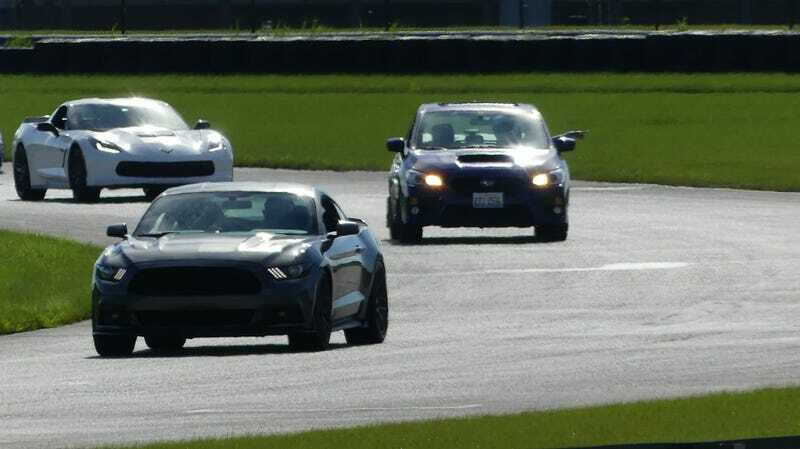 Soon I was going faster than the C7 through the slow turn 2 and my favorite section, corners 3, 4, 5. AWD meant once I’m pointed at the apex I can put the hammer down and go, no worries about oversteer like my new friend in the Corvette. Corners 3, 4, 5 are basically a constant radius slalom, that means that you can develop a rhythm of brake, roll-off, turn-in, power-on. Having three similar corners back to back meant this was where I started to push the WRX, find out what its max cornering feels like, how the gas and brake effect it. Now before I go lulling you into thinking I knew what I was doing out there, with all this fancy sounding discussion let me freely admit that I was butchering the course. I don’t think I did any single corner on the track in a way that could even remotely be described as correct or optimal. That said, this is an unspeakable amount of fun! I’ve done autoX, I’ve done ice racing, but this is a whole other animal! Towards the end of the first session I was wanting to pass that Corvette, but they were not about to let a car that cost half as much with half the power pass them on the straight (the only legal passing zone, with a point by). Apparently being badgered by me was enough to convince them to start pushing harder because by the end of the session I couldn’t keep up anymore. After twenty minutes or so the checkered flag flew I slowed down for the cool down lap before finally raising my fist out the window and pulled off the track, into the paddock. I slid the car to as stop on my trusty old wooden block and began inspecting the car before my next session which was set to begin in only 20 minutes. Before shutting the car down I took a look at my accessport, which I’d been glancing at while on track, my water temperature never got over 215F, oil never got over 250F, DAM was solid and no knock to speak of. Next I checked that oil level and fluids which were both fine, the lug nuts were all still at the right torque, my tires however had between 6 and 10 pounds more air in them than they’d started with, so those all got knocked back down to 40psi. After all the checks were done I walked down the paddock towards the control tower to try to find the instructor to see if I could get a ride along for the second session. Unsurprisingly he was booked up apparently until the fourth session so I said to put me on the list for then and went back to my care to quickly chug some more water because the five minutes to beginner session two call had just gone over the loud speaker. Starting this session I had a lot more confidence, I still didn’t really know the racing line, particularly turn-in points, but at least I wasn’t going to be a hazard to myself or others on track. For this session my biggest focus was on braking I know I wasn’t really pushing my equipment at all and I was starting to brake way sooner than I needed to be. Trying to shorten the braking zone is an incredibly intimidating because you’re staring at a grass runoff second guessing if you’ve giving yourself enough space to slow down and make the turn. You know you were way early last lap, but still that grass patch looks way too close for comfort! So after 20 minutes of playing chicken with my own insecurities the checkers fly and the session is over. Upon my space in the paddock my friend told me to pull back up into the grid and find the instructor because he’d agreed to take me out in the advanced group to give me a driving lesson. So without even shutting my car off I pull up, the instructor gets in, he talked me through the course once more and gave the standard “tires can only do one thing well at a time speech” before directing me to pull back on to pit road and get ready to reenter the track. Soon we were on the track and he directed me through the correct turn in points, where I should be clipping the curbs and my favorite, that on turn one you can hop the curb, putting both inside wheels up on the flat top of it, in order to straighten out the corner and give you an easier, straight braking zone for turn 2. This is fun because going down the front stretch I get to 103mph, then brake, downshift to third, hop on top that curb (which you cannot actually see at turn in) at 75 mph while briefly back on the gas, and then majorly whoa it down to about 35 for the next turn. Doing that is a massive rush and more than a little bit terrifying. This session was interrupted when not far in front of me a Porsche 944 blew a hole in its engine and left a streak of oil from the apex of turn 4 all the way to track out. When I came upon this there was a massive wall of smoke and the car had come to a rest facing the wrong way on the inside of turn 5. Basically if you were laying an oil slick on Mario kart this would be an ideal way to do it because it went all the way across the track so it was impossible to completely avoid. You might remember that changing surface flag I mentioned earlier, well this is what it is for. I’d slowed way up for it when it happened, but even with the flag and knowing it was there the next time around is still hit the oil and caught some oppo catching the ensuing slide. The next time by they ended the session to give time for clean up, because it was not safe to run. Still I got about 10 laps with the instructor and learned a ton about how to go fast on this course. As I was coming in I glanced at my gauges and realized that I’d managed to burn over half a tank of gas during the two and a half sessions I’d ran, thinking now that equates to 50 mintues of racing so I suppose that shouldn’t have been as surprising as it was to me at the time. My instructor informed me that they did in fact have fuel for sale at the track even (105 octane) but since even the 93 was over 9 $/gal and I’d burned at least 7 gallons of gas it made more sense to leave the track and go to a nearby station where it was more like 2.70/gal. Once I got back they had the oil cleaned up and had started the advanced run group back up so I quickly checked over the car before I was time to run again. As I was waiting my friend told me I should get Harry’s laptimer so I could get an idea of what times I was running and by the time that was installed it was time to head out again. During my fourth session I used what the instructor taught me and kept working on braking. At one point I started to get a weird feeling in my brake pedal, it was pulsing slightly while braking. I was worried that something might be wrong so I slowed down for a couple laps to think about it, when I did the pulsing went away. Initially I though maybe my rotors were going bad, I’d experienced that before on my grand parents old jeep, it kind of felt like this, but at the same time my car’s only got 16k miles, no way they’re going bad already. Then I had an epiphany, bad rotors don’t stop pulsing went you slow down, but you know what I’d been doing the whole session? Pushing the brakes harder and harder. What happens when you get to the limit of hard braking in a late model car, say a 2015 WRX? ABS, duh! I was rolling onto the brakes so hard that I was creeping right up on the limit of grip and ABS started to gently fiddle with things as tires started to slip. At the end of the session when I came it the brakes were still smoking even after I’d been out of the car for awhile, I was definitely glad I’d done those brake upgrades. It’s worth mentioning that at this point the field had thinned considerably because a lot of the new car that had showed up (Camaros, Mustangs, and WRX/Sti) had not upgraded their brakes and had totally fried them. The last session was more of the same, pushing everything a little bit harder. As I learned to use everything my tires had it was possible to hear the occasional short screech as one of them crossed an asphalt patch or between different pieces of pavement. In this session I picked up a few tenths of a second on my previous best and strung together a bunch of really consistent laps. I’m in no way saying I mastered the track, but I was able to fall into a rhythm and lapping got a lot easier. Unfortunately all too soon the final checkered flew and my first track day was over. Upon checking the laptime I discovered that I’d managed to go three tenths of as second faster per lap in my basically stock WRX than my friend did in his “Stage 2” STi. With that feather in my cap I did a final check over the car and packed up all of my stuff to leave. I’m sure some of you came here hoping for some carnage and I’d hate to disappoint since you’ve managed to skim through this far, but unfortunately the only real damage was that my friend managed to melt one of his valves stems causing a slow leak. I loaned him my air pump so he could limp it home and then into a tire shop the next day, since none are open on Sunday apparently, it cost a whopping 36 dollars to replace. As for me, my car was fine, but I was beat. I had a hard time staying awake for my hour drive home and I got there I promptly passed out for the next 13 hours until I was jarred awake by my alarm for work the next morning. Anyone who says endurance racing takes no athleticism has never done it.